The parents of the murdered child abuse victim Victoria Climbie have launched a fund-raising appeal to build a school in her name. Francis and Berthe Climbie hope to set up the primary school in Victoria's home country of Ivory Coast. 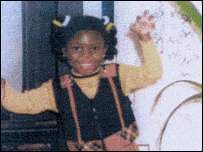 The eight year old died in north London in 2000 after months of abuse from her great-aunt and the woman's boyfriend. Her parents want to raise £250,000 through the Victoria Climbie Charitable Trust to build the school close to where the youngster was born, in the town of Abobo. They sent Victoria to Britain in the hope that she would have a better life and education than she could have had in Ivory Coast. The couple came back to the UK to meet Education Secretary Charles Clarke and the Minister for Children, Margaret Hodge. Mr Climbie said: "By building this school, we will not only honour Victoria's memory, but also we hope to make it unnecessary for children to have to make the journey Victoria went through. "Every child should not just matter in Britain but also in Africa. "Since every child matters we must make sure that this school is built so that we can prevent all the children from taking the same journey that Victoria has taken." Mr and Mrs Climbie formally launched their fund-raising campaign at the House of Commons. Mrs Climbie broke down in tears as she remembered Victoria as a "happy and clever" child who was full of potential. Her parents have been lobbying MPs at the Labour party conference in Bournemouth. Victoria's great-aunt and her boyfriend were jailed for life for her murder. An inquiry into the child's death by Lord Laming found that she had been let down by failings and bureaucracy in several agencies. Lord Laming said there had been fatal flaws in the system, which meant police, social workers and medics missed at least 12 chances to save Victoria's life. Last month, the government announced plans to overhaul the child protection system and bring in a Children's Commissioner for England. The aim is to improve links between the various authorities which deal with children and to define more clearly their responsibilities. Speaking through an interpreter at the Labour party conference, Mr Climbie said: "We have welcomed the green paper, the changes proposed, but more important to us is that the recommendations in the green paper are implemented and practised within the relevant professions. "If credible people are put in place, we have high hopes that we will see change in Britain." Mr and Mrs Climbie hope that Victoria's five-year-old sister Joelle will attend the new school.